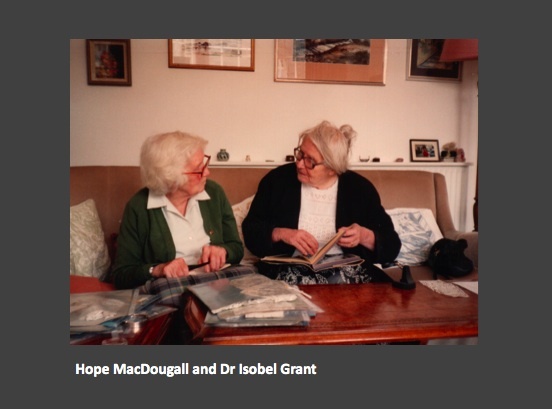 The Hope MacDougall Collection was gathered in the latter half of the 20th century with the specific purpose of recording the working and domestic life of Argyll and the Highlands and Islands, with comparative material from elsewhere. Daughter, sister and aunt to successive Chiefs of the Clan MacDougall at Dunollie in Oban, Argyll, Hope MacDougall fell into the category of ‘women of certain means’ who devoted their lives to creating a record of their chosen field: among them Evelyn Baxter and Leonora Rintoul whose natural history collection went to the National Museum of Scotland; and Dr Isobel Grant of Am Fasgadh/Highland Folk Museum. These women collectors are now clearly seen as a critically important group in terms of the 20th century record in rural Scotland, and are worthy of detailed study. Hope’s collection was mentored in its early stages by Isobel Grant who was a family friend, and then supported by Dr Alexander Fenton and Professor Hugh Cheape who emphasised the need to make it comparative and well provenanced, both of which were put into play. With a core purpose of amassing objects and archive which preserved knowledge of ways of life, crafts, skills and usage, Hope drew baskets into the collection entirely based on function rather than form. They occur throughout the collection in context of activity, and only appear as a discrete basket collection when we draw them together retrospectively. Her collecting was systematic and linear in the subject areas she pursued, a good example of which was peat: locations, users, cutting, drying, transporting, and burning. Her collecting method involved all means of recording the information. She was a superb photographer, producing outstanding images of people working peat banks in the Western Isles. She gathered peat spades from Shetland, Western Isles, Argyll and Ireland for comparison of type, with samples of peat cut by each one. She drew examples of methods of stacking peat, and photographed the stages. 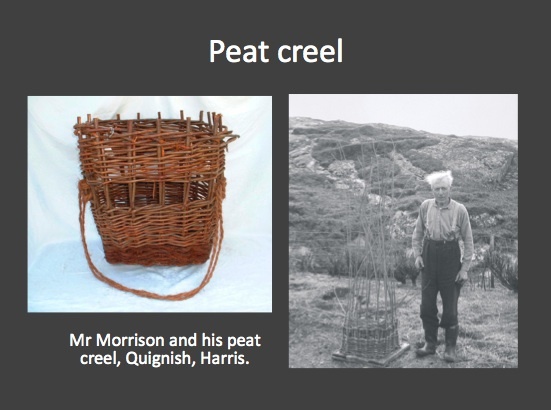 Critically, she acquired her understanding of peat creels by commissioning one to be woven by ‘Mr Morrison, Quignish, Harris’. This is a key point in the examination of a collection which seeks to inform about skills and modus operandi, as opposed to a social history collection gathered purely for the preservation of objects. Several of the baskets in the Hope MacDougall Collection are ‘modern’ and commissioned, the principle being that if the recording of function is to be taken to its conclusion, then the method of its achievement is as large a part of the story as the object itself. The peat creel was never used; at least, not in real time. It contains traces of peat dust from when it hung containing peats in her private museum in Ganavan House, Oban, where she lived from 1966 until her death in 1998. She photographed the creel being made, recording the maker as well as the method. She exhibited it in her private collection, and created a full explanation in her archive. It completed a circle in the story which arguably the simple keeping of an old peat creel could not have done, sacrificing the patina and kudos of age in favour of information. In other circumstances there was real impetus to find original items, and Hope made inroads into collecting the material culture of travelling people at exactly the same time that Hamish Henderson and others at the School of Scottish Studies were gathering their oral traditions. She often spoke of the barriers to be overcome, and used her idiosyncratic lifestyle to gain some acceptance: famously responding to a question as to whether she had ever ‘lived outside’, by answering ‘yes’; remembering the four years she spent sleeping on a balcony while nursing in Angus, rather than endure what she regarded as a stuffy dormitory. She gathered such objects as she could from the travellers in their benders; horn offcuts, tins and tools, and some of the finest baskets in the collection. This was not an occasion for commissions when much of the material was hard won. There is a clear distinction between collecting and accidental gathering, but both can end up as collections and exist side by side at Dunollie House. Hope MacDougall was a targeted collector, but grew up in an atmosphere of belongings which accrued over 800 years of family history. The old kitchen was full of stacked baskets; gathered, not collected, but a marvellous collection nonetheless, reflective of social structure and life in an estate community. It includes commercially made Victorian travelling baskets of all shapes and sizes, an Edwardian picnic basket, many locally made baskets, and a mysterious round basket with a slender plaited handle which was found in a box of old fireplace paraphernalia in the servants’ quarter’s Boot Hall. The Woven Communities Symposium provided the beginning of the answer: Carlos Fontales identified it as made of Esparto grass, with clear provenance to Southern Spain. The only other basket he had seen of this curious shape was larger, and for silkworm cocoons. How such a basket might have arrived at Dunollie is not too much of an enigma. It could have been any of the two generations of men who served in the Navy and Army, but the Peninsular Wars loomed large, and Captain John MacDougall had a raft of fashionable sisters. We will never know, but it is quite possible that a basket of cocoons was a fun and useful souvenir; the basket to be discarded for use by servants. Hope MacDougall’s collection found its way from Ganavan House to storage at Dunollie, which in 2012 opened its doors for public access for the first time; the Servants’ Quarters transformed into The 1745 House with the old kitchen still festooned with baskets.